An inner-northern suburb of Melbourne, In the 1800's, Brunswick was known for its brickworks providing the football team with their nickname as the ''Pottery Workers'. 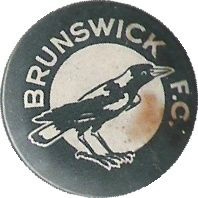 The Brunswick football club was formed in 1865 and joined the VFA as one of the replacement teams in 1897 when a number of clubs left the VFA to form the VFL. They achieved three VFA premierships (1909, 1925 and 1938) as well as three VFA second division premierships (1975, 1980, 1985). In the mid 1930's the club was in dire financial trouble and after the 1933 wooden spoon, the club resorted to selling its players to richer VFL clubs. In 1934 Frank Anderson, Dave Arnol and Wally Mutimer went to Carlton and in 1935 Bervyn Woods and Harold Jones went to Collingwood. Not only did the club survive but it then had one of the better runs in the club's history. Brunswick were minor premiers in 1936 and 1937, topping the ladder at the end of the home and away series and in 1938 defeated Brighton to win their third (and final) VFA premiership.